Illustrator Alice Stevenson talks about her creative involvement in the branding for Amy's Mobile Kitchen. During February 2016 the vegetarian and organic food experts of Amy's Kitchen bring you Amy's Mobile Kitchen - a vintage van that serves delicious Amy's soups and chillis across London, Manchester and Glasgow, free to those who make a donation to local charitable organisations. The delicious & warming soups & chillis are accompanied by outstandingly good bread from local artisan bakeries. Joining this project is artist Alice Stevenson, who has previously created illustrations for fashion designer Marc Jacobs. 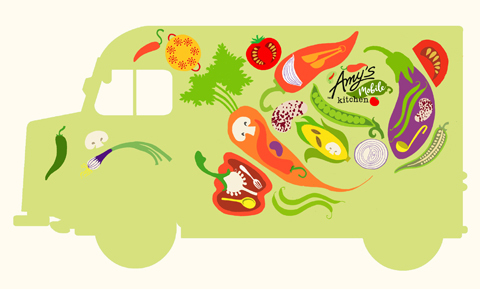 Alice has created a bespoke logo for Amy's Mobile Kitchen as well as designing the bright illustrations that adorn the van, making it impossible to miss as it travels the UK streets. She is a London based illustrator, artist and writer whose creative output is informed by her observations of the world around her, using striking colour palettes, playful compositions and decorative forms to communicate ideas and narratives. Below, Alice Stevenson kindly tells us more about this lovely project. This year Wood Festival celebrated the Year of the Bee, as several hundred families once more gathered in the beautiful fields at Braziers Park to enjoy great music and fun times. Looking for some interesting ideas for family outings with small children in the Lake District? Then look no further than these great suggestions. A review of our family holiday at the award winning Holgates Silverdale Holiday Park in the Arnside and Silverdale Area of Outstanding Natural Beauty. We booked a weekend for 6 toddlers and their mums at the Camber Sands Holiday Park during the winter season, and here's my mini review. Brighton Permaculture Trust have huge plans for a new venue that will process waste fruit and offer learning opportunities for locals. Funding through Buzzbnk crowdfunding website now! We experienced our first Big Fish Little Fish rave at Shapes in Hackney Wick. Here's an interview with founder Hannah Saunders. Support Adam Sayner and Eric Jong's GroCycle business, which grows gourmet mushrooms on Coffee Grounds. On Thursday 11th December contributors and special guests gathered to celebrate the launch of That Which We Do Not Understand at the Tatty Devine shop on Brick Lane. Artist Rima Staines and poet Tom Hirons have dreamed up a wonderful plan to convert an old Bedford lorry into a travelling theatre and storytelling vehicle for the imagination... find out more below. Author and craftivist Betsy Greer talks about her new publication: Craftivism. Get inspired! On Saturday 27th September 2014 the Royal Observatory in Greenwich held a lecture in conjunction with the Petrie Museum, combining astronomy, Egyptology, experimental archaeology and art. Be inspired! Held during the Bank Holiday Weekend on August 22nd-25th 2014, Into The Wild Summer Festival was a truly relaxing adventure and a great alternative to busier, larger Summer Festivals - with a serving of food for the soul on top! Flat 130 opens to the public as part of Balfron Season, with retro design by the Hemingways and a tour taking in the local area. Held on the 16th-20th July 2014, this Buddhafield offshoot gathering was the perfect antidote to my hectic London life: a way to reconnect with the earth and enjoy quality time with my wonderful toddler. Stuck for a Valentine's Day gift? Here's how to make your own. Read on and learn how to craft your very own Hanging Heart Decoration, using a wire coat hanger, fabric or ribbon scraps, fine wire and a few beads or sequins. It's super easy, honest!